Our monthly cruise review starts out in a rather negative way but gets very positive with a preview of All Leisure Group’s completely renovated MV Minerva. Also for this issue only we list some of the bargains that are currently available from the cruise industry. The big news for your diary is Tuesday 3 July when all seven ships (Adonia, Arcadia, Aurora, Azura, Oceana, Oriana and Ventura) in the current P & O fleet assemble at Southampton to celebrate 175 years of the shipping line. The full name was Peninsular and Oriental, but that was back in 1840. BT News has no intention of naming the cruise company involved in the tale that follows. The line comes out with absolute credit. However certain national newspapers, whose reporters read this publication, might just take the piece out of context in order to ‘splash’ a story. With the repercussions of the Costa Concordia disaster still with us we believe it is worth reporting the efforts of a responsible and very professional cruise operator faced with potential problems. A foggy mid-morning east of Suez, the constant moan of fog horns is perhaps not what the less than 1,000 passengers on a luxury cruise ship would have bargained for. Nor would they have been prepared for the sudden thump as an unregistered, non-radar equipped small freighter smashed in the ship’s bow. With the emergency siren sounding and the PA system requesting all passengers to assemble at their allocated muster stations complete with life-jacket the crew showed their efficiency as the ship sat motionless in the water with its fog horn constantly sounding. That an emergency drill had been carried out before the ship had sailed on the cruise indicated that crew and passenger actions went smoothly and information soon came through that the ship was in no danger. Notably spare life jackets are also stored at each muster station and when returning to the suites (no cabins on this luxury ship) a red indicator on the door showed that it had been checked for occupation during the emergency. The passengers and crew were stood down after 30 minutes and all returned to normal. A courtesy drink was called for, the stocks of brandy going down fast. The bars were crowded. It has been announced that Costa Concordia is to be re-floated at a cost of US$300m. Work is now getting under way. Earlier this year MV Minerva emerged from a highly successful £10m refit at Bremerhaven. Minerva has a fascinating history, both as a ship and with Swan Hellenic, its owner. 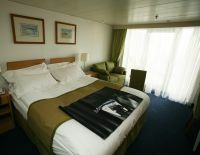 Swan Hellenic itself is part of the All Leisure Group. Chaired by Roger Allard, a industry stalwart, the Group also takes in Swan Hellenic, Voyages of Discovery, Hebridean Princess Cruises, Discover Egypt, and its latest acquisition, the long-established tour operator Page and Moy. (see issue 28 November). The ship’s arrival at its new home port of Portsmouth (issue 28 April 2011) was the culmination of an interesting few years for most captivating of stories. Originally laid down at Nikolajev in the Ukraine with a view to Antarctic operations, Minerva is today a true boutique ship, 350 passengers maximum, a country house afloat, and a quality product. All Leisure has somehow managed to combine the qualities of the Minerva, as was, with that of Minerva II. But more anon. In August 1954 Swan Hellenic operated their first cruise under the direction of Ken Swan, taking 128 passengers by train to Venice, where they joined the ship and cruised between Venice, Piraeus and the Aegean islands. The archaeologist Sir Mortimer Wheeler was employed as guest lecturer and to this day a bar on Minerva is named after him – thus continuing the Swan Hellenic tradition of cultural cruising. Then and now the package was simple. A very much inclusive educational holiday. Quality lecturers. A complimentary land tour programme. No tipping and free parking or travel (for ex-UK programmes) to the port of embarkation. And of course dining and entertainment of a high standard. In fact once you have paid for your holiday it is possible not to spend another penny. In any event there are no service charges at the various bars and your final bill will be in Sterling. Completed in 1996 as a cruise ship Minerva went into service that year, the company by that time part of P&O. Balcony accommodation was limited to just 12 suites, which very quickly sold. P&O itself was taken over by the Carnival Group in 2002 and Minerva was replaced by Minerva II (an R class ship and now called named Adonia). Some Swanners (Swan regulars) complained that the new product lacked the intimacy of the previous vessel but in any event Carnival decided that a one ship product did not fit in with their philosophy. With the backing of the former P&O Chairman, Lord Sterling, All Leisure Group Plc acquired the brand for the 2008 season. Well established in the cruise market with Voyages of Discovery it was already operating Minerva under another title. It soon became apparent that Minerva, for all her virtues, was in need of a major overhaul, and that the market was calling for many more balcony cabins. A great deal of planning and thought was required not only to bring the ship up to the latest standards but also in terms of enhancing its specification for the benefit of passengers in the years ahead. Last winter she spent three months of round the clock docking at Bremerhaven, finally emerging in March 2012 as virtually a new ship. 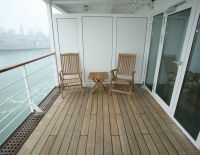 How to achieve 32 new balcony cabins? It’s very easy in retrospect. 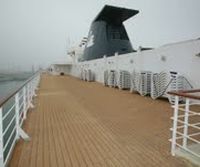 Minerva had an excellent ‘walk around’ promenade deck with large non-balcony cabins, the windows of which enabled occupants to see out without anyone seeing in. The solution was to turn the promenade into individual balconies for each suite, all of them totally re-modelled and most tastefully furnished, including many with baths. The resolution of the problem of not having a promenade was easy to provide. 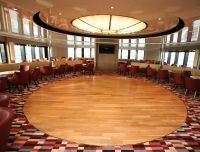 The old funnel deck has been turned into a walk-around area and the Orpheus Lounge added, with a dance floor and small stage, together with an excellent inside forward viewing area, something the ship lacked in the past. The popular Shackleton Bar, where guests can enjoy pre-dinner drinks, has also been extended. The overhaul of the ship has been most comprehensive. Out went the old cinema, a six-station internet lounge added, and the latest keep-fit equipment installed into a new gym area. All the cabins have been refurbished, more artwork has been added to the many corridors, often supplied by guests. The huge library with 5,000 books thankfully has not been touched and (particularly on long voyages) the laundrette remains. Much of the £10m has been spent on the engineering side of things. With the dry dock facility available the underwater manoeuvring pods have been relocated to the stern. The ship can now turn on a sixpence and gain entry to much smaller ports. The stability has improved also. Minerva trundles along at a steady 14 knots. Each sailing is escorted by guest speakers who bring the destinations to life, covering topics as diverse as the legacy of Tsarist and Soviet rule to the archaeology and culture of Greek Islands. Every guest speaker is an expert in their field with many considered to be the world’s foremost authority on their subject. 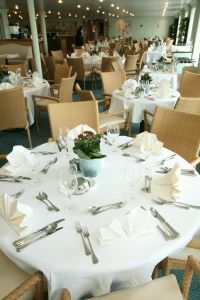 Minerva operates until 1 August a series of mainly 15-day cruises, including separate circumnavigations of both the United Kingdom and Ireland, to Norway and France. She then leaves for the Mediterranean for a whole series of fly-cruises, with a passage down the Suez Canal just before Christmas. Please note that normally all prices are based on two sharing and clearly Business Travel News cannot be held responsible if the price has changed or the ship sold out. Some cruise lines include gratuities but reckon on £4/£8 per day per person otherwise. Parking can be expensive (and free in some cases) and check to see if a flight is included. Several weeks back we mailed all the leading cruise lines asking for the lead in price for cruises in June, number of days, and very simple basic routing. Some responses were fast and excellent, others took time to answer properly but did so in a professional manner. Sadly in other cases all we received were either long and boring press releases or even worse unedited sales brochures. And from some nothing. If you fancy trying a cruise now is the bargain time to book.